During my 3rd range test of my FNAR, I was experiencing technical difficulties with the rest I was using for shooting my rifle. Since then, I'm now the proud owner of a X7 Bulls Bag system. You can see the review of this bag at this link, X7 Bulls Bag Review. Actually during my next range testing I plan on evaluating the accuracy of my FNAR and the performance of the X7 Bulls Bag as a rifle rest. For me to compare apples to apples from my last range test, I did purchase two boxes of ammo that I used during those tests. The Hornady and Federal performed the best out of the original range test, but I must say that I don't feel that test was a good measure of the rifle or ammo due to my technical difficulties. Regardless, I still needed to compare some of the same ammo during this test. Next, I have seen other reviews that used Buffalo Bore Sniper .308 Win 175 gr. Sierra bullets. This was a must for my next range test and I can only hope to produce results similar groups to the other reviewers. I really want to find ammo that I can use for long range shooting and this may be the ticket. This range test will be only at 100 yards, but if it groups good, I will do a future test at 200 or 300 yards. Additionally, some more ammo I want to try out will be some "readily available" hunting ammo. What I mean by "readily available" is something that I could find by walking into any Wal-Mart. I don't want to be caught off guard during hunting season. Off guard would be me knocking my scope off zero and shooting up the ammo I took with me. I know it is a worst case (I hope), but I want to check and make sure the rifle will group this ammo. I selected one that I have seen at nearly every Wal-Mart in the south (Winchester) and then another popular brand (Federal). Last, I plan to shoot some PMC 147 gr. FMJ-BT just to get the hang of the rest system prior to the high dollar ammo. The following is the list for this range test and in the order I plan to shoot. This should be a good day's worth considering the time needed for the barrel to cool down between groups. After 3 hours at the range, I feel like I had great results. I shot several different three shot groups of each of the ammo. I started with the PMC just to get the feel of the X7 Bulls Bag, then I quickly moved on. The photo below shows my basic setup. The X7 Bulls Bag supported the rifle, but I also used a small bag under the bottom of the pistol grip to help me further stabilize the shots. My first task was to compare the Hornady A-MAX results with the X7 rest against what I was able to do with the other mechanical rest. My best groups this time were 1.20", 1.20" and 0.75". The 0.75" group is shown below. Clearly the X7 system was more stable when shooting. My best group with this ammo at my last range test was 0.95" with the next closest being 1.87". At this point, I was sold on the X7 Bulls Bag. Next I switched over to the Buffalo Bore and achieved my best groups. I shot 1.05", 1.00", 1.00" and 0.35" groups at 100 yards. This was the first time I had used the Buffalo Bore Sniper 175 grain bullets and I was extremely pleased. Clearly, the FNAR with the right ammo and right marksman can be a sub MOA rifle. I also wanted to check out the Federal Premium Vital-Shok® Sierra® GameKing® BTSP 165 gr. that I used in my last range test. With this mid range price hunting ammo, I was able to shoot groups of 1.25", 1.10" and 1.00" at 100 yards. Again, my best group last time was 1.54". Clearly, this is an improvement. What I do find interesting is that the ammo will group in different points on the target. I made no scope adjustments to this point. Now I wanted to try out some of the bargain priced "readily available" hunting ammo from Wal-Mart. First I shot groups of the Federal Power Shok 150 gr. Soft Point hunting ammo. 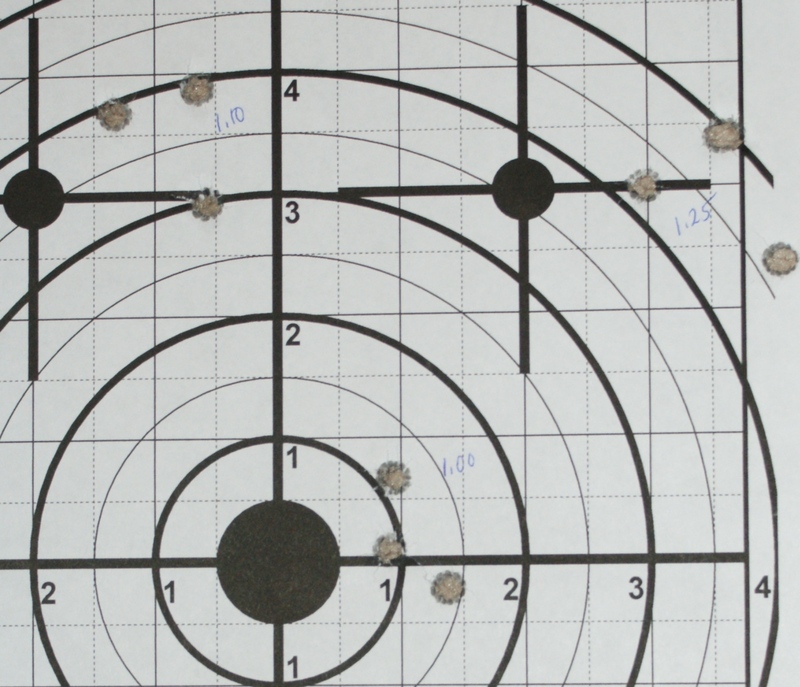 The 3 shot groups were 1.75", 1.45" and 0.88" at 100 yards. I was pleasantly surprised with these results. 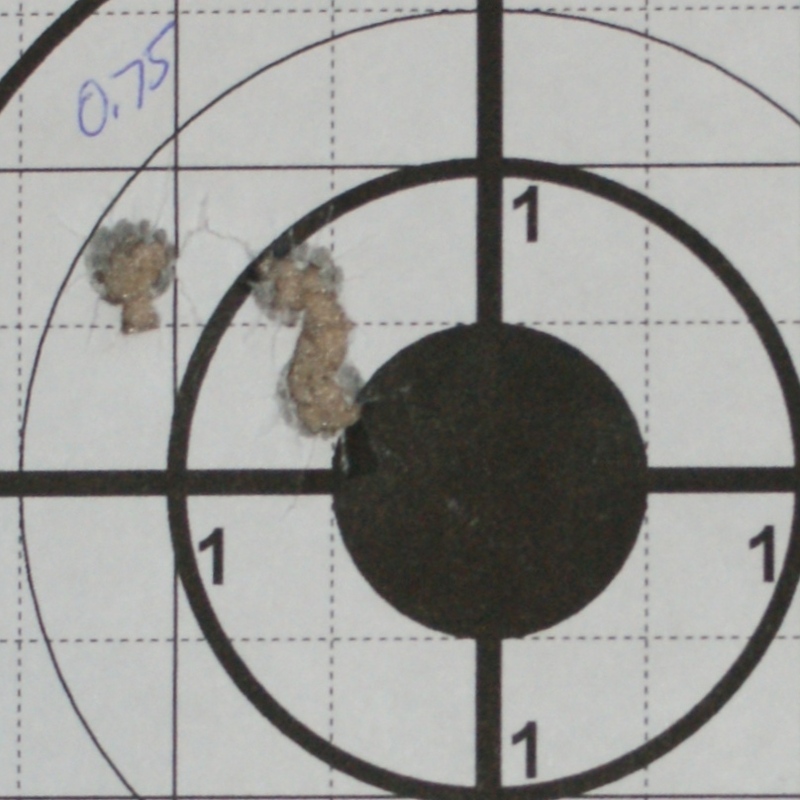 I also decided to adjust the windage on these shot, so you will see the fourth shot of my first 0.88" group. Last was the Winchester Super-X 150 gr. Power-Point hunting ammo. The 3 shot groups were 1.25" and 0.80" at 100 yards. You will see another group on the target below, but I'm not going to count that because I knew I pulled the shot when I made it. During the three hours of shooting, I learned a couple of things. First, it takes more concentration than I ever imagined to try to consistently group shots. In the past, I have always gone to the range and sighted in my hunting rifle and then moved on with life. Those efforts may have been a total of about 30 minutes. Second, in my mind the greatest amount of variability comes from the average shooter. I'm sure that for trained marksmen this may not be the case, but I believe that my FNAR is more capable than I am (at the moment) and thus more capable than most of the people who will purchase the rifle. Third, a shooting rest system is a critical item for shooting groups like this. Clearly, I shot more 1 MOA or better groups during this round of testing using the X7 Bulls Bag than I did with the mechanical rest. The FNAR rifle can shoot. The real question is can you? I think this range test proves it can group many different types of ammo, and it made the best group with the Buffalo Bore 175 gr. Sniper ammo. As I continue shooting my rifle, I can see that I'm already biased towards the Buffalo Bore for a target round. The next thing I have to do is finalize my hunting round, but I'm not worried too much. Based on the results above, I can always stop by Wal-Mart and get a box of Winchester or Federal and put meat on the ground out to 200 yards. I am VERY interested in your experience with the FN AR, because I have two of them, and have had quite a bit of trouble with them in the accuracy department. I have already sent one back, and FN replaced the gun. So far, the only ammunition I have had any luck with at all has been Lapua 170 gr. Lock Base, but even it displays horizontal stringing. I will be eager to strike up a dialog with you on this situation, as you are the first "real guy" that I have encountered that has done this much leg work on the gun. I wonder how many rounds you had through the tube by the time you made this report. While these are hardened barrels and theoretically don't need breaking in, it's generally thought that increased round count in the early life of a barrel enhances accuracy. I wonder if that is an additional factor, along with increased famililarity with the gun. Would you agree that this is a decidedly difficult gun to shoot, compared to a bolt gun? I think it has to do with the pistol grip, but I find myself having a difficult time getting comfortable on it. I have not decided yet which ammo I'm going to shoot. I liked match ammo (A-Max or Buffalo Bore Sniper), but I want be taking any of that to the field hunting. During my 4th range test I had about 200 rounds through the rifle and had cleaned the barrel regularly throught shooting. I'm not saying I'm the best shot, but I think I can do better than the average guy. The first thing is to make sure you are making all your shots from a bench and are really bagged in. Also, I'm not sure how long you allow for cool down between groups. If you can drive nails with your other bolt guns, then maybe none of this is an issue. I think that it may be a harmonics issue. Take a look at this site. I think that some of the match ammo out today is designed in the sweet spot for most guns. I can't say the same about the hunting ammo because I'm still looking for the best for my rifle. Realistically, I feel like I could take a shot out to 200 yards without a problem with nearly anything I decide to shoot. My problem is deciding what to use to zero the rifle since they tend to group differently. I'm already purchasing more ammo to checkout and will head to the range in a couple of weeks, so I will try to give some more range results. To answer your question about the difficulty to shoot the gun, I believe this is a matter of preference. Now that I have been shooting my FNAR, my trusty old Remington Model 788 bolt just doesn't feel the same. It is sad because I purchased that gun myself 30 years ago and it has made every deer season since. I'm really looking forward the taking the FNAR into the field. The pistol grip is what I like best about the rifle. I think it gives better control of the rifle, but I have also been shooting a Ruger 10/22 with a pistol grip stock for about 20 years and I'm sure that helps(1000s of rounds shot). You may already know this, but do NOT use match ammo for hunting. While the projectiles look deadly enough, they won't hold together and will just create a superficial wound. They are built for stability and nothing else. We're on the same page through the rest of your comments. I've just strange experiences with this gun so far. One has been replaced, and I'm seeing horizontal stringing, when I can get a group at all. FN claims that Federal Gold Medal Match 168 is the preferred ammo for this gun. I've never gotten it to shoot well in this gun at all, but I can drive tacks with it in my other guns. Target attached. The FN AR that shot this target (gun #2) is going back to Missouri this week. Sorry the photos don't show up. The blog commenting tool is not as fancy as some other sites. I did look at them and you have a nice collection. I'm surprised about the Federal Gold Medal Match. I purchased a box last week and I'm planning to shoot this weekend if work doesn't get in the way. Don't worry, I know about the difference between a target and hunting bullet. Your FNAR results being over a 2" group at 100 yards were similar to when I was using a mechanical rest system (Lead Sled). When I switched over to a sand bag system I got better results as shown in this post. My question, are you doing anything different with the FNAR that you don't normally do shooting. Obviously your Kimber group is a good indication you can shoot. No, there's nothing different going on with my setup, conditions, fatigue, etc. And I've done this type of thing multiple times, in fact it is practically a 100% repeatable phenomenon that I can shoot as shown with the Kimber (or that Tikka...that thing is even more accurate), and then follow up with a disapointing, not as advertised target from the FN AR. Bags, precision rest, bipod/rear bag, Aegis guidance system, you name it. I can beat the FN AR with the M1A SuperMatch at 100 regularly, and it has iron sights. Keep in mind, FN replaced Gun #1...after they re-barreled it and it still wouldn't shoot straight. Gun #2, which shot the target you see, is on its way to Missouri. In all fairness, FN's customer service has been superb. Looking closely at your photos, I believe your gun is the "light" barrel version? In particular, I'm looking at the shoulder in the barrel taper just below the objective lens. Not sure it is important, just trying to identify every variable. Please clarify. If your is the heavy barrel, there would be a difference, but I would expect that to be able to achieve a greater accuracy. It would be great to get an update on the FNAR. I'm considering a purchase of one due to the accuracy and stock accessories. My main concern is iron sights. I like iron sights and the more accurate the firearm the better. I'd like to have something that could be used in HeMan 3-gun. After searching extensively through the forums, I've yet to see an iron sight set up. People have pointed out that some barrels were drilled and tapped for a front sight, but I've yet to see what they used. Any input on that would be appreciated. A long term report on throat erosion, general accuracy, and tightness of the parts would be great also. I'm working on a 5th range test update now and should have it posted over this holiday weekend. I has seen some info on the web that states the barrel being drilled and tapped for a front sight, but I have never seen this version of rifle. It might end up being a little micky-mouse, but you could clamp a barrel rail mount and then install some backup sights if you could get the height difference between the front and back rail to work. UTG sells a cheap mount so you could give it a try. See the link below for the mount. JOHN, IF YOU TRULY WANT OUTSTANDING GROUPS FROM ANOTHER ROUND, THEN PURCHASE A BOX OF FEDERAL MATCH GRADE AMMO USING THE SIERRA MATCHKING BOAT TAIL HOLLOW POINT BULLET. I HAVE YET TO FIND ANYTHING MORE ACCURATE, I KID YOU NOT. I WILL TRY THE BUFFALO BORE AMMO AS A COMPARISON FOR SURE JOHN. I LOVE THE BUFFALO BORE AMMO VERY, VERY MUCH, ESPECIALLY IN MY 45-70, AND .44 MAG IN 340 GRAIN. John, also consider the purchase of a Savage 20 inch heavy barrel, in .308 with a 6x24 scope of your choice. These rifles are incredible john, and not to mention fairly in expensive! 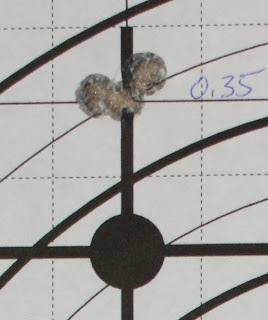 I have achieved groups of less than .40 at 100yrds on a regular basis using federal match grade ammo, and these groups were based on a five shot group. I will purchase a box of buffalo .308 and do a comparison soon, and then i will get back to you. I have the winchester version All cameo heavy barrel with a Nikon 4X14 cyote scope (what can I say the cameo pattern matches). I hunted with this combo last deer season using hornady 168gr balistic tip with good results. this combo gives me 1 1/2" groups at 160 yards. I do not hesitate to recomond this weapon just wish it was lighter. I bought my FNAR in Sept. of 2013. I too have had very frustrating and inconsistent accuracy results. It does not like Fed GMM 168 ammo at all (2.7" groups). I just sent mine to the factory for service now, June 2013. Mine had a MN in the serial # meaning it was built in 2009. You can see my posts and targets in the FNFORUM website under FNAR. Lots of good info there.